To call the Year of the Canine to a close, Zuan Yuan Chinese Restaurant is set to herald the Year of the Swine with an extravagant spread. Embark on a prosperous beginning as the kitchen experts bring time-honoured favourites to enrich the ambience of gatherings. Chefs of Zuan Yuan Chinese Restaurant sets the bar to delight and amaze discerning guests of all ages with bountiful offerings. Choose from three specially crafted set menus priced at RM1688.00nett, RM1828.00nett and RM2188.00nett for lunch or dinner, each promising diners a sumptuous feast. Every set ordered will receive a complimentary bottle of wine, to enhance the dining experience. 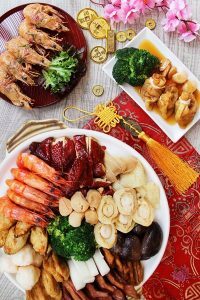 Zuan Yuan needs no introduction, having been acknowledged as one of the most acclaimed Chinese restaurants in Petaling Jaya for its authentic Cantonese cuisine, optimum quality, varied choices and great value.